"The 2013 American Peony Society Convention was in Kennett Square, Pennsylvania this year with the convention, competition, and auction being held at Longwood Gardens. Longwood Gardens was a magnificent place in size and grandeur with plenty of color in various garden rooms, rolling landscapes, fountains, and unending glass conservatories. An entire weekend would not be enough time to explore all they had to offer, had that much time been available to me. Although I visited for the weekend, the American Peony Society convention kept us all quite busy. The peonies this year were quite a contrast to the peonies at last year’s convention. They were actually in bloom! There were several trial beds at Longwood Gardens that had been planted the previous fall containing Award of Landscape Merit peony plants that were donated by the APS. Amazingly many of those first year divisions were blooming, with sometimes more than one bloom per plant. It seemed like the trials were going quite well! Longwood Gardens also has several named varieties of herbaceous peonies planted interspersed within their perennial borders, and these mature peony plantings really stood out! Lunch was served in the Longwood Gardens Founders Room. It was a beautiful dining room with an entire wall of windows offering a nice view of the greenery outside. The weather was warm, so lunch was a welcome respite from the heat of the day. The chilled water with citrus slices was my favorite way to cool down while waiting in line for lunch and chatting with and getting to know a fellow APS member from China. The food was outstanding. Everything was so fresh, and there was plenty to choose from – gourmet sandwiches, garden salad, pasta salad, and a selection of fresh sliced fruit, with cookies and brownies for dessert. I attended the board meeting after lunch and took the remaining part of the afternoon to explore the gardens. Longwood Gardens’ official peony garden was a bit of a disappointment, containing only tree peonies, most of which had already finished blooming, and lots of irises – almost more irises than peonies! However after speaking with a member of the Longwood Gardens staff, I did find out they planned to renovate it in the future. In the evening after exploring the gardens there was a “Taste of Philly” picnic with Philly cheesesteak sandwiches and chips for dinner and snack cakes and Hershey (PA) chocolates for dessert. Saturday was a busy day with everyone bustling to get their peonies entered into the show and competition. 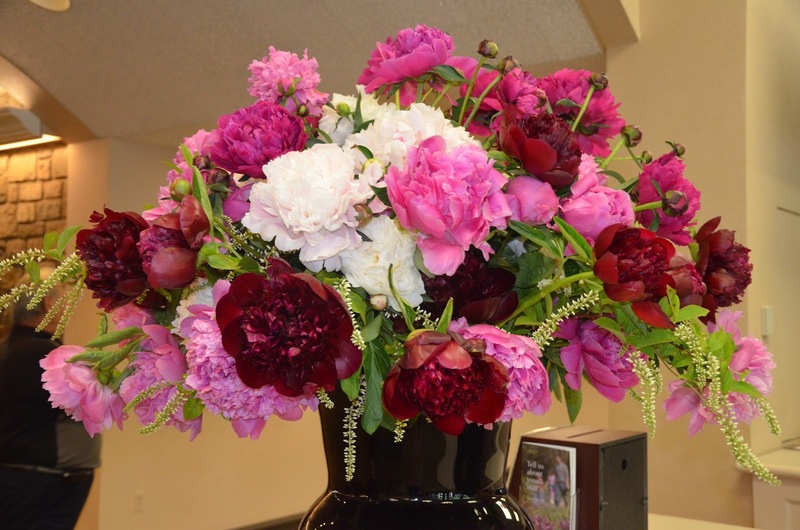 Peony stems were sorted and clipped, entry tags were filled out, and vases were filled with water and flowers. 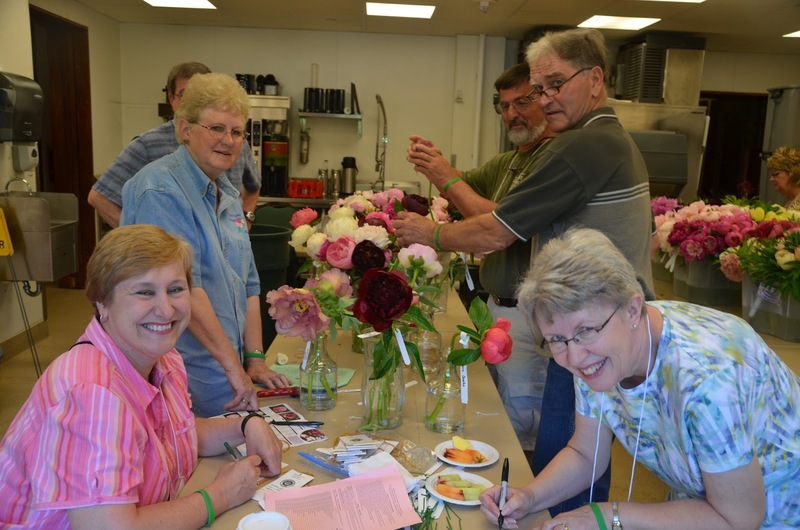 Lots of peony growers were represented and volunteers from all over helped with running flower entries from the prep area in the kitchen and patio area out back to the exhibition tables and judging area inside the Longwood Gardens atrium. Finally it was time, and Dana Tretheway called for final entries. I participated as a judge for the first time this year, and it was quite exciting as well as a great learning experience. Eventually all of the ribbons had been placed, and all of the blue ribbon winners were collected for another round of judging. The most experienced judges were set to decide the best in show for several different categories, and then selected from these category winners, the APS Best in Show flower. 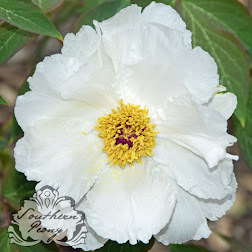 Tree Peony ‘Boreas’ was awarded this top honor for 2013. After the judging was complete, the exhibition floor was opened to the public for viewing the vast number and variety of peony blossoms from all over the country. There were several seminars in the afternoon, and the banquet was held directly after in the stately Longwood Gardens ballroom. The ballroom was truly a sight to behold. Its grandeur matched only by the palatial fountains outside the atrium steps and the castlelike exterior of the conservatory itself. The room contained a large organ installed by Pierre du Pont, walls of pink satin and dark earthy wood paneling, and huge yet delicate crystal chandeliers that dimly lit the room for dining. 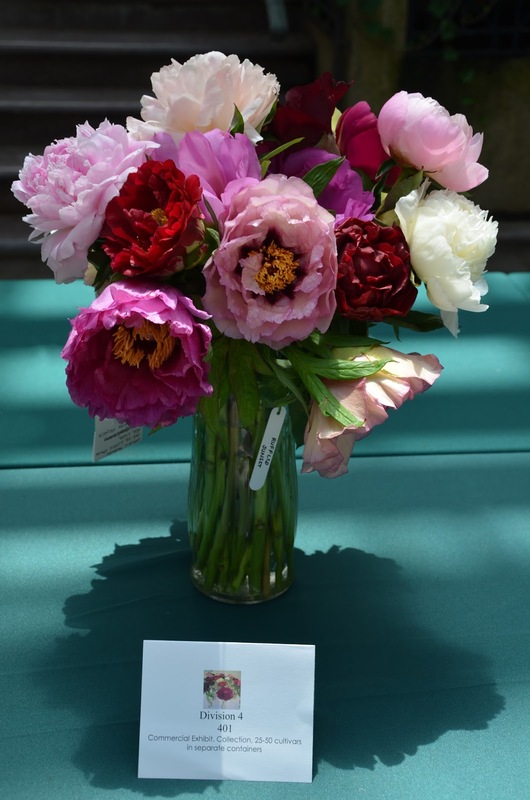 Dana Tretheway held the APS general meeting, during which a new peony was dedicated to W.E.B. 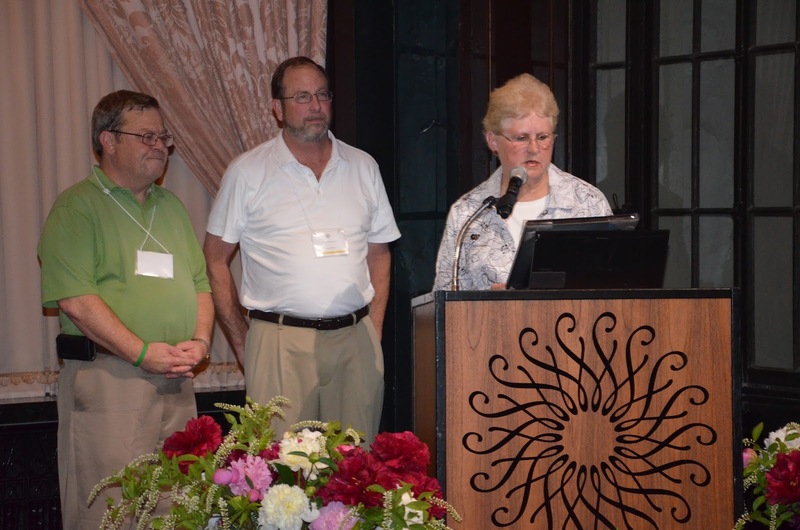 Du Bois, and the Bertrand H. Farr lifetime achievement award was bestowed upon Don Hollingsworth. Dinner was fit for royalty. There were beef medallions that melted in your mouth atop polenta with fresh seasonal veggies. There were three miniature strawberry desserts that all were unique and delectable in their own right. After dinner the annual APS auction was held. This year Jim and Lore Sampson double teamed the auctioneer role, and did a great job! 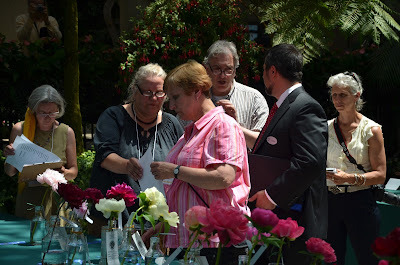 The auction list was very long, but everything was sold, with all proceeds benefiting the American Peony Society. 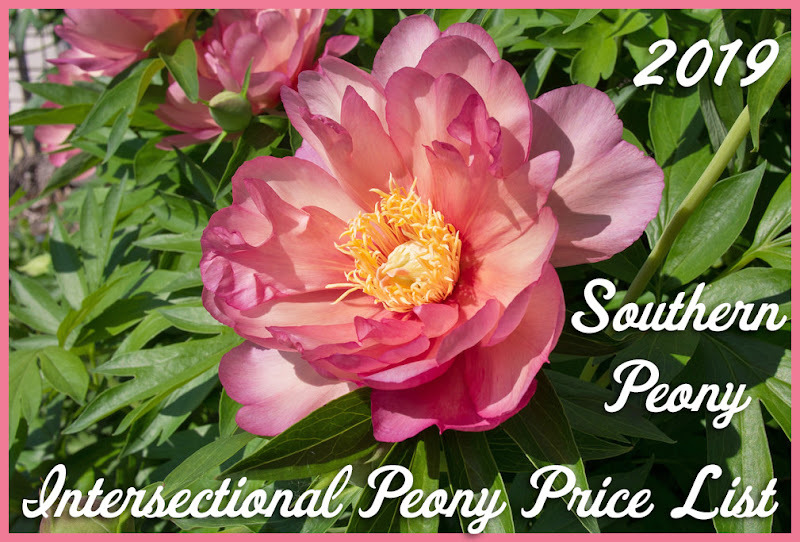 There were several new and exclusive peony varieties that were bought for less than their retail value. So there were lots of deals to be had at this year’s auction. The last day of the convention was spent at Winterthur. Although the house was not as grand as I’d expected, I was left wondering since we were only able to tour a portion of it. Apparently they rotate which sections and floors are open for touring to let sections of the collection ‘rest’. So the house was probably much larger than the impression I was left with after the tour. The Winterthur gardens were a marked contrast to those of Longwood. They were much more natural, laid back, and in some instances almost overgrown. It was as if many of the gardens remained just as they’d been left by their last owner, the landscape almost frozen and nature allowed to somewhat take back the formal areas. The did however have a much more mature plantings of tree and herbaceous peonies, which were nearing the end of the bloom season. The tree peonies were planted in a garden mostly shaded by tall trees, which could be viewed from a nearby peaceful, white, wooden gazebo. The herbaceous peony garden was slightly more formal laid out within and around a rounded stone pathway with a small garden bench along the edge to rest in. All in all the 2013 American Peony Society Convention was a great success, and I look forward to the next one!"